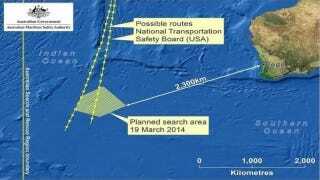 The search area for missing Malaysia Airlines flight 370 has been drastically reduced tonight as U.S. and British transportation officials have narrowed the search by refining satellite signals, suggesting two possible but close-by paths off the coast of Australia, heading toward the South Pole. As reported by ABC News, U.S. officials were able to learn more valuable information from the satellite pings than first expected. Australian aircraft are searching the new area, along with a U.S. Navy Poseidon P-8 submarine hunter. The FBI is also in the process of examining a flight simulator confiscated from the home of Flight 370 Captain Zaharie Ahmad Shah. Authorities have yet to name any suspects, but are focusing on the investigation from the standpoint of it being a deliberate act. "I would like to take this opportunity to state that the passengers, the pilots and crew remain innocent until proven otherwise." The conference was marked by protests and outcries of grief from family members of Flight 370's passengers, accusing the government of being cheats and hiding the truth.